Try to poke my eyes now! One of the Stock Poses: a character holds his or her sword upright, with the blade between his or her eyes, often followed by Stab the Sky. The pose originates in the European Swordsmanship tradition. When saluting a superior, a Worthy Opponent, or the audience, the swordsman would bring his sword-holding hand in front of and close to his throat, with the tip pointing up and slightly forward, then slash down sideways, so the point stops near the floor next to his right foot. According to The Other Wiki, this custom originated during The Crusades, when the knights kissed their swords as makeshift crucifixes before charging into battle. Nowadays, it is mostly seen in competitive fencing, but has also seeped into all kinds of media thanks to the sheer awesomeness of the move. Sailor Saturn from Sailor Moon does this with her Silence Glaive when she's about to use it against Queen Nehelenia in the first part of Stars. Oscar does this in Rose of Versailles when she swears by her uniform and sword she won't neglect her duty. In Soul Eater Black Star alternates between staring through his sword and his free hand (which he keeps in the standard martial arts index/middle finger up, ring/little fingers folded) while training with Tsubaki's Fey Blade form. Played for laughs (as you might expect) by Prince Charming in Shrek 2. 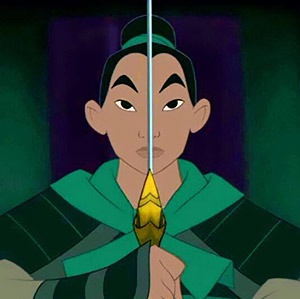 Mulan does this after her Important Haircut. Her father does it as well, when he first retrieves his sword and armor. Both times it represents the wielder's internal conflict between duty and family. Pulled of by Sir Orrin Neville-Smythe in The Flight of Dragons. Notable for being performed during a Badass Boast and maintained even as he is being burned alive by dragon fire! Aragorn does this at the beginning of the battle with the Uruk-hai in Fellowship of the Ring. Viggo Mortensen makes it come off like a pre-battle salute. Invoked in part by Théoden in The Two Towers, when he first picks up and looks at his sword. The actor even clarified in the commentary that he was supposed to look past the sword to avoid looking cross-eyed. Followed by a glance at the held-down Wormtongue. During the dueling club scene in Harry Potter and the Chamber of Secrets, Harry and Draco mimic the classic fencing salute with their wands during the pre-duel, which incorporates this trope. Frequently done in the original Conan the Barbarian, as well as Conan the Destroyer. The cover of Caine Black Knife. In the Star Wars, EU, practitioners of the Makashi style of lightsaber combat would sometimes perform a "Makashi salute" before fighting an opponent. The salute involves holding the lightsaber vertically in front of their face, then swinging it down toward the side. The illustration of the Duelist Prestige Class in the Pathfinder core rulebook depicts a duelist performing a fencer's salute with her rapier. Strong Bad does this in Strong Bad's Cool Game for Attractive People: 8-Bit Is Enough after claiming the Trogsword, throwing in a Shout-Out to while he's at it. In the PS and DS versions of Chrono Trigger, Frog does it in at least one cutscene. Ryu does this on the cover of fourth Breath of Fire. After obtaining the Master Sword in The Legend of Zelda: The Wind Waker, Link slashes the sword 3 times looking incredibly badass, then stares through the sword with a look of uncontrollable excitement, then decides it's cooler to close his eyes and solemnly Stab the Sky. In the "Warden's Calling " trailer for Dragon Age: Origins, the unnamed Grey Warden briefly does this as the Deep Roads gates open to reveal an army of Darkspawn he is about to charge. For extra awesome, he tosses away the sword's sheath just before that and envelops the blade in magical flame. In The Matrix: Path of Neo Neo does this in an in-game cutscene, after defeating three Bosses, programmed sword-fighting demons, in a training simulation. Fire Emblem: Eliwood does this when he gets a Critical Hit. Carrying over from Attack of the Clones, Star Wars Rebels has the Grand Inquisitor and Kanan do a Makashi salute before their final battle in the first season finale. It is used to established that Kanan is going all out (because with Ezra being believed to have fallen to his death, Kanan believed he had nothing to lose if he fights now), and both sides acknowledge the other as a Worthy Opponent after spending the entire season of the heroes fleeing from and/or losing to the Grand Inquisitor. The next time a Makashi salute is performed, it's a Five-Second Foreshadowing because Kanan's opponent, the Sentinel, is the Force's manifestation of the Grand Inquisitor when he was still a good Jedi. Lion-O of Thunder Cats and ThunderCats (2011) does this with the Sword of Omens during his Once per Episode By the Power of Grayskull!. In some instances, as he's using the Third Eye in the hilt of the sword to activate his "Sight Beyond Sight" ability. In modern fencing, the salute has three steps, the first one is Stab the Sky, the second one is Staring Through The Sword, and the final one is Swipe Your Blade Off without the blood. Also used in professional military drill when an officer is called upon to present a salute with the sword. Example: officers of the household division (Guards) when saluting British royalty at full-dress events such as the Trooping of the Colours.